A national park and a long-running tradition combine over a handful of December nights. A national park lodge and a long-running tradition combine and get Christmasy over a handful of December nights. THE AHWAHNEE DINING ROOM... boasts a supreme stateliness and sense of drama every single day of the year. You can sit within its grand space and rock-laden walls on a Tuesday morning in April, sleepily buttering toast, and you'll look as though you belong in a fairy tale or some other fanciful story. A great setting can lend much to even the most day-to-day activities -- see: buttering toast -- but when that great setting is paired with a great gathering, the fictional vibe goes through the roof. Make that the famous wood-beamed roof, or, er, ceiling rather, of The Ahwahnee Dining Room. A great gathering gets matched with that marvelous space each December, when the lauded, huzzah-happy Bracebridge Dinners return to Yosemite National Park. These are the ones you've heard about forever and ever, the meals you had to enter a lottery for, but the lottery is no more: You can purchase a ticket and/or a room package at The Ahwahnee or Yosemite Lodge at the Falls or The Wawona Hotel (yep, there's transportation to the event, since The Wawona sits a fair distance from The Ahwahnee). And those tickets and packages? They're available now, still in the heart of summer, even though the December lark is still months away. Why? BECAUSE THE BRACEBRIDGE... is on many bucket lists. It has been a Yosemite holiday must-do since 1927, when no less than nature photographer Ansel Adams was involved (he played The Lord of Misrule). 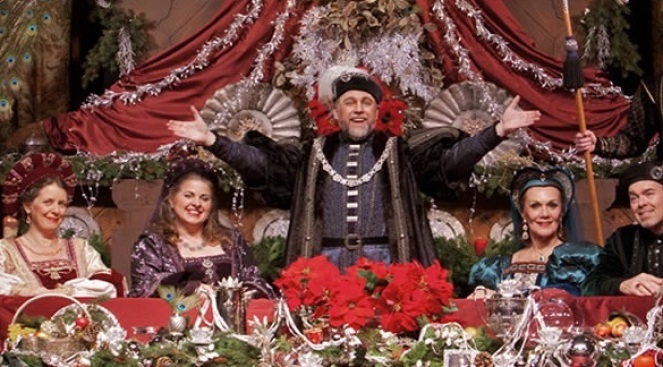 It's got a medieval theme, and a strong yuletide-y atmosphere, and the multi-course dinner is presented with more pomp and more circumstance than a half dozen pomp-and-circumstance-filled to-dos. You can eye past menus, if you're curious about how big this thing gets, meal-wise, and the photos tell the story of what you'll see and experience: A ye olde Christmas feast with characters aplenty, all in the storybook setting of The Ahwahnee Dining Room. We can't all attend a royal ball circa 1505 but saving and splurging one year on this December staple might be a mite easier than constructing a time machine. You don't need to stay at the hotels, by the by, if you want to just do the dinner; there are options, m'ladies and lords.